Hulk-Ultimate Revenge Slot Machines UK Slots | Try your Luck & Win! Join the Incredible Hulk as he causes mass hysteria on his ultimate revenge. Hulk-Ultimate Revenge slot is a game developed by CryptoLogic casinos and is available online for free and you can play for real money on any listed CryptoLogic casinos. The game has 5 reels and 25 pay lines and the player can only bet one coin per pay-line. This no download slots video game gives you numerous chances to win huge jackpots on the base game and more jackpots using the free spins. Plus, random jackpots exist too. Use the ‘Lines’ + and – buttons to adjust your pay lines. ‘Max Lines’ will automatically set the number of pay lines to 25. Use the ‘Bet’ button to place bets on each active pay line. Click on ‘Spin; to start playing. The ‘Autoplay’ feature is also available and will only stop where player intervention is required. Click the + and – buttons to adjust your spins. Symbols that will appear on the reels include guns, ammunition and SWAT teams. The coin size ranges between 0.01 and 5. The Hulk is the wild symbol and this gets the player a payout that is worth double the combinations. It appears on all reels and can replace all standard symbols except the scatter symbol. The scatter symbol for the Hulk-Ultimate Revenge game is an explosion. Combinations of these symbols do not matter which reels they appear on. This symbol will trigger the bonus game. This is triggered by 3 or more scattered explosions. Throw an object at a helicopter to reveal the number of free spins you win or the multiplier value that will help boost your winnings. A 5000-coin jackpot exists once you get 5 wild hulk symbols. 2500 coins are rewarded when you get 5 scatter symbols and 1000 coins for 5 SWAT team symbols. The progressive jackpot is only available for those playing with real money. Make the bet to increase your money. A spin can activate the Marvel Jackpots which are randomly awarded. These are namely the Hero, Super Hero, and the Massive Super Hero Jackpots. The higher your wager, the higher your odds of winning. The Return to Player rate is about 94.5%. 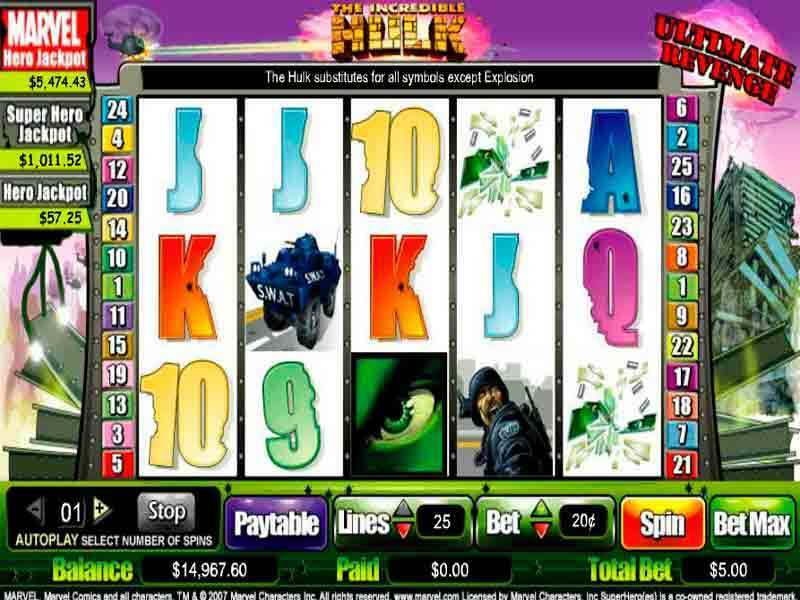 The theme of the game is very popular amongst its players hence making this online video slots game one of the best. The game keeps you excited as you watch the giant green monster cause mayhem to reward you with more winnings. You do not particularly have to be Marvel Comics fan to enjoy this game. To play Hulk-Ultimate revenge for free, all you have to do is enjoy slot games and be prepared to win some good money. Other Marvel slot games related to the Hulk-Ultimate Slots game are also available at any online casinos for players interested in playing for fun or for real money. For customers in the UK, all online slots gambling games are licensed and regulated by the UK gambling commission. 0 responses to "Hulk-Ultimate Revenge Slot"